Google+ has been a controversial and underwhelming social media platform mostly populated by profiles made out of obligation in order to use Google’s services, but this will change soon as Google announced Google+ will no longer be a requirement for services across Google’s network. Since Google made their social platform a requirement for all other services across their site, including Gmail and YouTube, there has been a strong pushback from users. The negative reaction was especially prevalent for YouTube users, who were forced to create new Google+ pages if they wished to create a new video channel. 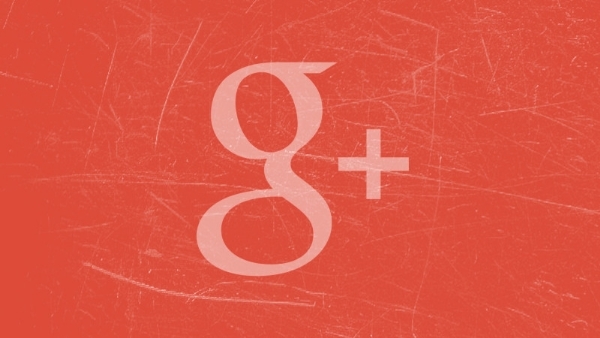 Over the next few months, Google will be uncoupling Google+ from all services. This means all it will take to access any Google products or services is a simple Google account. Once this is complete, users will be able to use YouTube, Gmail, or Google Analytics using a traditional Google account. For users who were already pushed into making Google+ accounts, you will soon be able to remove it, although Google didn’t provide any more details about how or when. With this change, Google+ will now be completely optional. This may be good news for users, but it will be interesting to see how the platform handles the shift. Many have already proclaimed the social network is dead, but it is entirely possible setting it free from the rest of Google may finally give the platform a chance to grow with only members who want to be on the social network. Google has confirmed it has released a Google Panda refresh over the weekend, over 10 months after the last update to the algorithm. The latest refresh is unique from past updates as it went virtually unnoticed by webmasters until it was announced by Barry Schwartz. This is because it is being rolled out far slower than in the past. Previous updates were rolled out usually over a period of a few days or at most a couple weeks, but Google says this latest update could potentially take months to fully roll out, even on a site-by-site basis. However, as it is a site-wide algorithm, it will not be on a page-by-page basis. Google was not willing to provide any information about why the rollout is being done so slowly. Unfortunately, the slow rollout does not mean you can expect to make any last minute changes to save your site. It is too late to change your fate with Panda 4.2, although it’s always good to make any improvements you know are needed. Schwartz also noted his personal SEO news site, which was penalized by Panda 4.1, does show an increase in organic traffic since the update. That means others who were hit by the last update may see small improvements as well. The Panda refresh is expected to impact approximately 2-3% of queries, meaning it is a relatively small update. While the refresh may be good news to webmasters who were impacted by 4.1, most people are less pleased – particularly by the slow rollout. It may be months before we know the impact of the refresh thanks to the slow implementation, but, considering there hasn’t been an update since October of last year, it was past time for it to happen. Mobile search has gotten a lot of attention this year as it has overtaken desktop search in many metrics, but a new report from mobile loyalty company SessionM shows how ubiquitous the use of mobile devices to aid in the shopping experience has become. SessionM surveyed 12,000 randomly selected US smartphone users on their mobile shopping behaviors and the findings highlight just how large a role mobile devices play in the shopping process. The company said 85 percent of respondents reported their m-commerce buying was steady or had increased compared to a year ago while approximately 15 percent told the company mobile buying had increased “significantly. Personal data security and/or poor user experiences (e.g., too small images or text) were cited as barriers preventing mobile e-commerce from more growth. According to the findings, more than 90 percent of respondents had made a retail purchase within the past 90 days before the study. The majority (73 percent) of those purchases were made in traditional, brick-and-mortar stores, and approximately 53 percent said they found the in-store experience superior to online/mobile shopping. The data confirms what several other studies have found in the past. 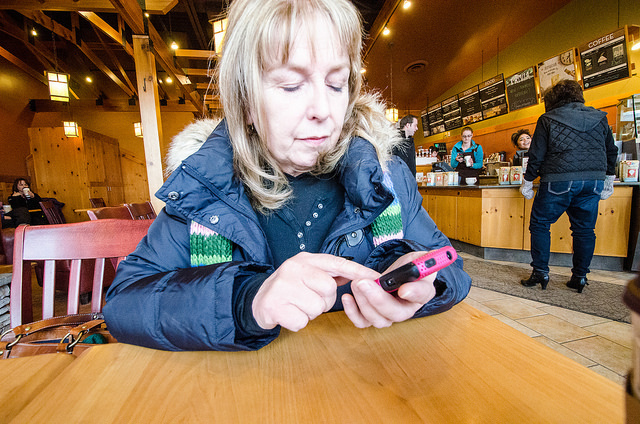 Shoppers are using their smartphones in stores to help them make informed purchases, but many retailers are failing to take advantage of any of the opportunities this presents. A Google Sitemaps bug is causing many webmasters to see significant indexed page count falls within Google Search Console, but a fix should be on the way according to Google. Google Search Console, known as Webmaster Tools until recently, is experiencing an issue causing confusion and concern among webmasters and marketers as huge declines are appearing in the indexed pages shown in the Google Sitemaps report. If you’ve encountered similar drops in indexed page counts on your reports from July 14, there’s no cause for alarm. The glitch will be fixed soon and won’t affect your traffic or rankings through the search engine in the meantime. 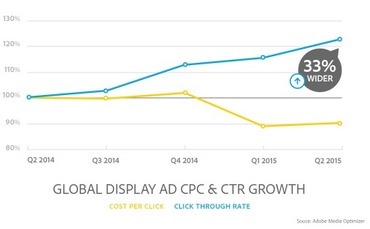 While display cost-per-click (CPC) growth is steadily falling, Adobe’s new Digital Advertising Report shows the opposite is happening on smartphones. Using aggregated, anonymized data gathered over the past three years, Adobe assessed over 489 billion digital ad impressions. 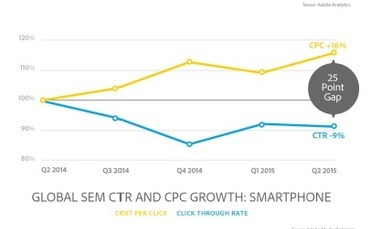 According to the data, click-through-rate (CTR) growth is consistently rising, but CPC growth how hit a steep decline over the past year, especially between Q4 and Q1. At this point, there is a 33-point gap between CTR growth and CPC growth, despite the two being nearly equal at this time last year. However, smartphones seem to be bucking the trend. Mobile CPC growth is up 16 percent while CTR shows a 9 percent decrease year-over-year, leading to a 25-point gap. 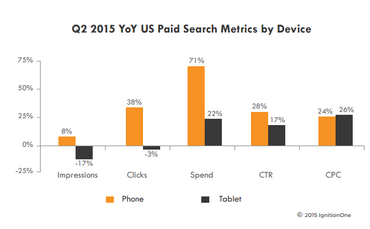 Adobe’s team believes the so-called “mobilegeddon” is largely responsible for the spike in mobile paid search. The team also said price is another favor facilitating the increase in CPC growth on smartphones. According to Tamara Gaffney, principal analyst for Adobe Digital Index, clicks on mobile are cheaper than desktop clicks, but the trend is unlikely to stick around. 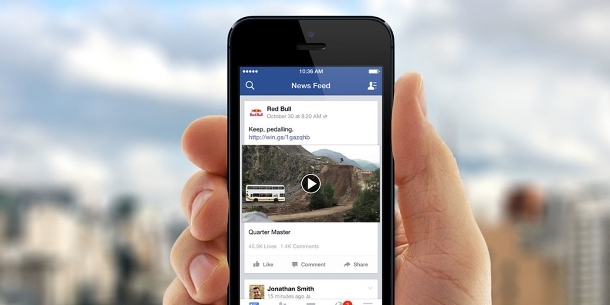 Facebook also saw a 23 percent increase in clicks, despite showing half the impressions year-over-year. 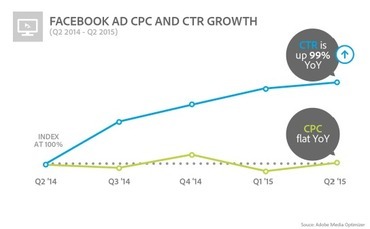 The social platform’s CPC has largely stayed stagnant, but CTR growth has shot up 99 percent YoY. Adobe says Facebook’s huge increase is the result of improved targeting on the platform, with 51 percent of U.S. consumers saying they believe Facebook ads are genuinely of interest, compared to just 17 percent of consumers on YouTube. Gaffney also said Facebook has decreased the overall number of ads it shows users to create a better balance for users on mobile screens. “[Google is] starting to lose ground as a marketing vehicle and part of the reason why is because they aren’t getting as many clicks out of global display ads,” Gaffney says. Google has dominated the search market for years, but the latest findings show they are slowly losing ground. Google still holds 65 percent of the global search spend share, and 61 percent in North America, but Yahoo and Bing’s combined efforts is gradually rising 4 percent year-over-year. Today, Google announced their highly anticipated ‘Buy’ button with the unveiling of the new “Purchases on Google” feature, along with several other big upgrades. Select retailers running mobile ads can now choose to include a ‘Buy on Google’ option that takes shoppers to a branded product page hosted by Google. From there, shoppers can finalize their purchase and save purchasing information for future use if you choose. According to Google, this feature is only in the experimental early stages and is being limited to a small number of retailers. 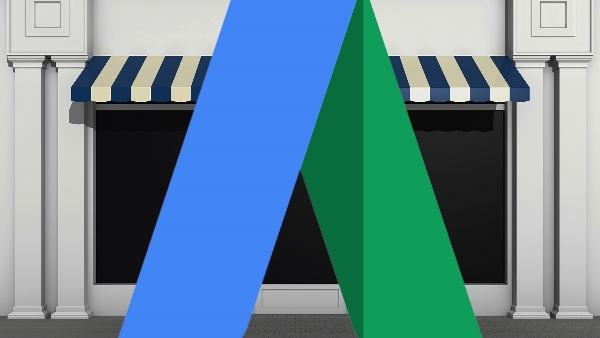 Retailers who choose to use Purchases on Google will only have to pay for clicks on the shopping ads to the product page. They will also have the option to invite customers to join their mailing list during the transaction. While Google will take responsibility for hosting product pages and providing security throughout the sale, it will be up to retailers to provide customer communication. Swipe to Reveal: When a user swipes on a Google ad carousel will show more information about the products, including price and availability. Ratings and Reviews: Shopping ads with product ratings and reviews will now be shown if searchers use specific trigger words, such as “best”, ”reviews”, “recommendations”, etc. Priority for Local Inventory Ads: LIA’s will now receive priority for local intent shopping queries. App Deep-Linking: Ads from select retailers will now include links to view a product on their app.Today, Google announced their highly anticipated ‘Buy’ button with the unveiling of the new “Purchases on Google” feature, along with several other big upgrades. So far, 2015 is shaping up to be a huge year for the mobile internet. Between Google’s “Mobilepocalypse” and the news that searches from mobile have overtaken desktop search volume, mobile was already on the way to dominance, but a new report from IgnitionOne shows mobile search spend is also growing by leaps and bounds. According to the recent Q2 Digital Marketing Report, paid search spending has risen 22 percent for tablets last year, and a massive 71 percent for smartphones. Both mediums showed comparable growth in CPC and CTR (24 and 28 percent for phones, 26 and 17 percent for tablets), but smartphone clicks have outpaced those from tablets by 41 percent. The report also noted smartphone impressions had climbed 8 percent, but tablet impressions have declined by 17 percent. The report also showed Google’s display growth was down 9 percent year-over-year while Facebook’s is up 48 percent, which gives the social platform 16 percent of the display share. In comparison, Google’s share is at 31 percent, down from 38 percent last year. After years of debate whether another search engine could ever prove to be a meaningful challenge to Google’s market share dominance, Facebook’s recent gains suggest it may actually be social media that poses the greatest challenge to Google. 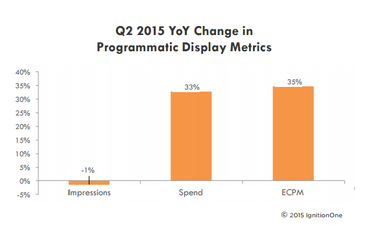 IgnitionOne’s research found programmatic data spend increased 33 percent year-over-year while eCPM rose 35 percent from last year. Impressions, however, have fallen 1 percent. Facebook is giving users the ability to choose what they see in their News Feeds, after years of relying almost entirely on its special algorithm to choose what to show its 1.44 billion users. 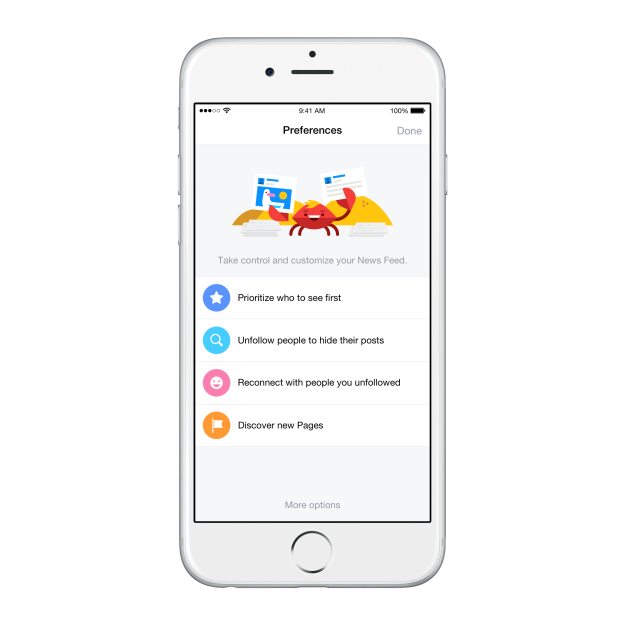 Of course, Facebook won’t be doing away with its algorithm anytime soon, but it is giving more power to the users to customize what they see in their feed. 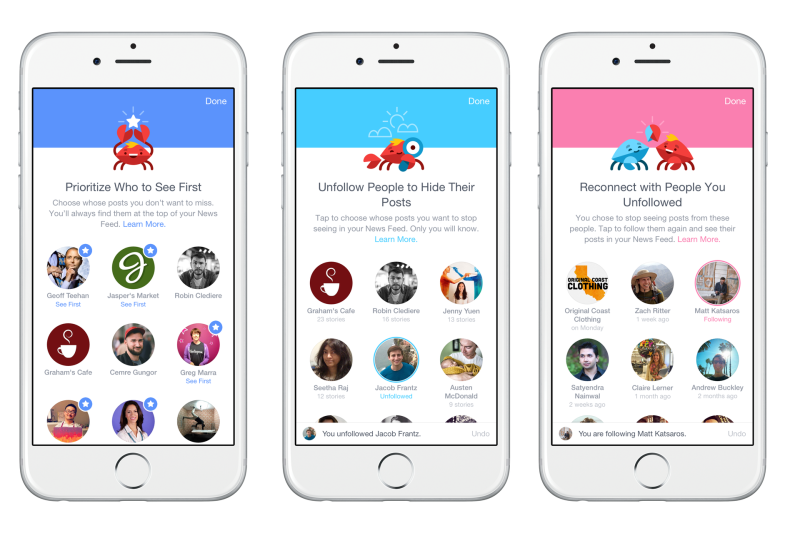 Essentially the update is a redesign and expansion of the News Feed Preferences feature available since last November, but it also includes some big changes for how you use the biggest social platform on the planet. You can now prioritize the friends and Pages you want to see first, and posts from these profiles will appear at the top of your feed with a star to signify its importance in the upper-right corner. The new feature also includes a feature which shows the Pages and friends which have been popping up most often in people’s News Feeds over the past week, so you can easily unfollow overposters or other people you’d rather not see. This also has a page which shows recently unfollowed users if you decide to reverse your decision. Similar to SnapChat, the update has a new discover section which displays Pages Facebook thinks you might be interested based on your other likes. The new features are already available on iOS, and will be available on Android and desktop in the next few weeks. 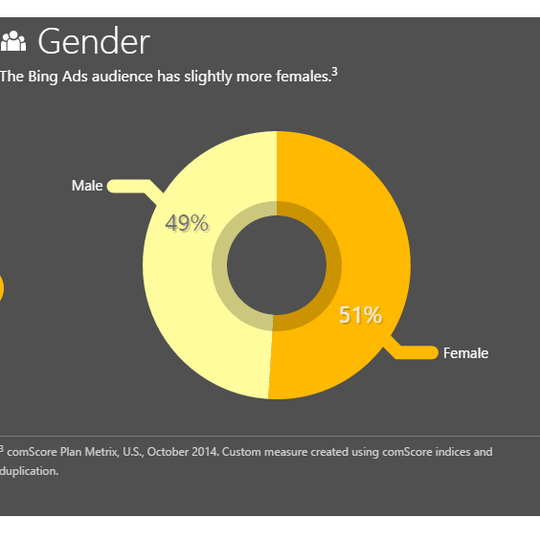 Bing Ads is improving its age and gender targeting by collecting more robust demographic data from users to help advertisers better target consumers. Advertisers can now utilize Bing’s new increased targeting features by setting targeting rules in “Advanced Targeting” within their Bing Ads dashboard. From there, they can segment audiences by age range, gender, device, and time, which will cause an automatic lift in bids when targeted audiences are searching. 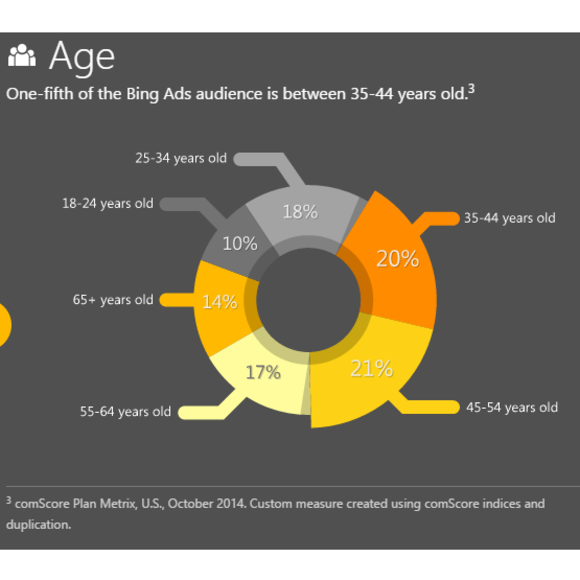 Along with the announcement, Bing Ads released comScore data on its current audience, showing Bing Ads audiences tend to be more female and are most likely within the age range of 35-44.